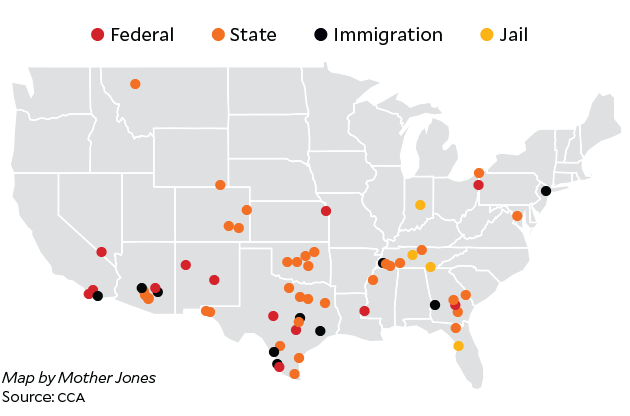 Where the pioneering private prison company operates, who owns it, and who’s taking it to court. CCA runs 61 facilities across the United States. These include 34 state prisons, 14 federal prisons, 9 immigration detention centers, and 4 jails. It owns 50 of these sites. 38 hold men, 2 hold women, 20 hold both sexes, and 1 holds women and children. 17 are in Texas, 7 are in Tennessee, and 6 are in Arizona. CCA and other prison companies have written “occupancy guarantees” into their contracts, requiring states to pay a fee if they cannot provide a certain number of inmates. Winn Correctional Center was guaranteed to be 96 percent full. CCA’S biggest investor: The Vanguard Group, the country’s second-largest money management firm, holds 14 percent of CCA stock, valued at $447 million as of late 2015. Thurgood Marshall Jr.: CCA board member, lawyer, and son of the first African American Supreme Court justice. Charles Overby: CCA board member and former CEO of the Freedom Forum, a foundation that promotes press freedoms. C. Michael Jacobi: CCA board member and chairman of gunmaker Sturm Ruger. Harley Lappin: CCA’s chief corrections officer and former director of the Federal Bureau of Prisons. “Frankly, we’re delighted to have a greater share of investors who are thoughtful about our business, can tell the difference between rhetoric and reality.” —CCA spokesman commenting on the University of California’s decision to divest in 2015. CCA told shareholders it faced $4.2 million in liabilities related to lawsuits in 2015, but it said no pending cases would seriously affect its bottom line. CCA will not disclose details about the lawsuits it faces. But data on more than 1,200 cases obtained by Prison Legal News offers a snapshot of the types of civil cases commonly filed against the company by its prisoners and employees. Prisoners filed 82 percent of the more than 1,000 federal civil cases naming CCA as a defendant between 2010 and 2015. Federal prisoner suits against CCA have fallen since they peaked in 2000, perhaps due to a 1996 federal law that made it more difficult for inmates to sue prisons.